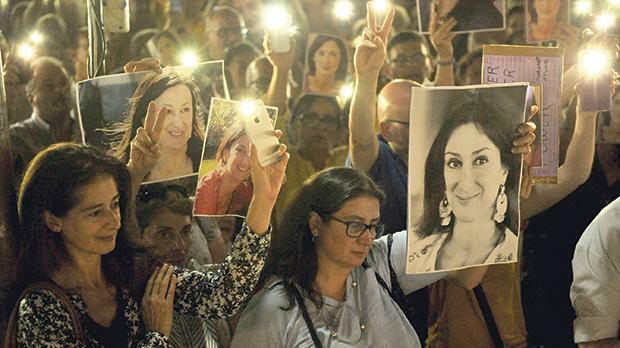 About three weeks ago, Steve Mallia, a former editor-in-chief of The Sunday Times of Malta and the Times of Malta, wrote a first-class article deploring the state to which elements of journalism in Malta have descended. The article was headlined ‘Journalism most foul’ and focused on what has happened to journalism in Malta in the last year or so. I know Mallia. He was briefly my editor when I started writing a weekly column for the Times of Malta. He has since been helping the Save Valletta’s Skyline Restoration Appeal – in which I am involved – on a pro bono basis. A consummate professional, he is dispassionate, independent-minded and objective. ‘Journalism most foul’ was written with commitment by somebody who cares deeply about the reputation and standing of journalism and a free and independent press in a country riven, in his own words, by the effects of “the most repulsive act in the living memory of anybody in the local press” when “Daphne Caruana Galizia was callously and sensationally… blown to pieces”. The crux is that “Freedom of expression is not carte blanche to say whatever you like. It’s about living in an environment where everyone can state their opinion unencumbered”. Taking the social media mob to task, he underlined that “this opinion does not necessarily have to be shared by everyone else. No one, however, should ever be free to fabricate or distort facts: not a politician hiding behind parliamentary immunity, not a commentator behind a fake Facebook profile and certainly not somebody who describe themselves as journalist and professes to provide the public with news”. The blogger Manuel Delia took particular exception to Mallia’s excellent piece on ‘Journalism most foul’ and wrote his own rambling blog commentary in reply. He did this by attacking Mallia for his editorship of The Sunday Times of Malta when the then Allied Newspapers managing director, Adrian Hillman, is alleged to have set up an offshore company to receive payments from other offshore companies owned by Keith Schembri, then the supplier of newsprint and print machinery to Progress Press, Allied’s printing company. The upshot is that Mallia is suing Delia for libel, pointing out that, as editor, he had “absolutely no involvement in the commercial operations of [Allied Newspapers] and was not in a position to know – let alone gain any financial benefit from them, which is perhaps the most repulsive fiction put forward by Manuel Delia”. He has vowed that no one “has the right to unjustly tarnish another’s reputation”. As the matter is now the subject of civil proceedings, I shall not comment on the details of the case. But I think it is fair to mention that, at the Times of Malta in particular, there has always been a very distinct division of responsibilities between what the editor of the newspaper does and what those responsible for its commercial operations do. This scenario no doubt also exists at other media organisations. Over 25 years ago, for instance, Robert Maxwell, the owner of the Mirror Group, was raiding the pension funds of all Daily Mirror employees. The editor was totally unaware. An editor (like Mallia) has an ingrained instinct to witness, verify and report and for choosing the stories which are printed and the accuracy and fairness with which they are presented. The owners (or commercial directors) – who are understandably interested in the commercial viability of the newspaper – do not intrude on a strong editor’s role. Today, Orwell’s 1984 is everywhere. In Malta, poisonous blogs purveying conspiracy theories, half-truths and unsubstantiated allegations have created a group-think echo-chamber for those reading them. The range and spread of information, some of it fake but all of it political, is now a threat to the public truth that a liberal democracy requires. A steady flow of disinformation and fake news through the medium of blogs, aided by trolls (many of them anonymous) to sow division and confusion, is arriving in readers’ inboxes dressed as impartial truth. Mallia’s article struck a much-needed blow for good journalism to be recognised. Those aspiring to Daphne’s mantle have increasingly allowed emotion to replace reason, facts to be subordinated to feelings, instant comment to be preferred to measured responses. ‘Journalism most foul’ was a powerful piece of writing that said what needed stating. It put the political predicament in which Maltese journalism finds itself under the spotlight. What Mallia wrote was not only elegantly and authoritatively expressed. It was absolutely incontrovertible and applicable to a whole range of social media platforms in Malta.